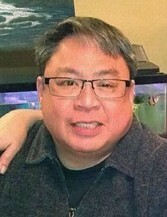 Ramon T. Valdescona, 57, of Jersey City passed away on Friday, April 12, 2019. Ramon was born Marikina, Philippines and moved to Jersey City in 1995. He worked for the TSA at Newark International Airport. He was a member of the Free Mason Pyramid Lodge 490 in New York City. Ramon was the beloved husband of 25 years to Janette (nee Belmonte); devoted father of Jeremy Valdescona; dear brother of Soc, Deng, Joey, Manny, Duke and the late Belen, Fe and Bong. Also survived by many loving in-laws, nieces, nephews, cousins and dear friends. Visitation for Ramon will be held on Sunday, April 14, 2019, 3:00 PM to 7:00 PM, and Monday, April 15, 2019, 5:00 PM to 9:00 PM at the Riotto Funeral Home & Cremation Company, 3205 John F. Kennedy, Blvd., Jersey City (For GPS use our parking lot address 14 Stagg St.). Funeral Services will begin on Tuesday, April 16, 2019, 10:30 AM at the funeral home. Funeral mass will follow 11:30 AM at St. Aloysius Church, Jersey City. Interment will take place at Holy Cross Cemetery, North Arlington.